I try to throw a personal touch in the cards- I print specific cards for each event. Typically weddings- when I shoot the engagement shots, I then take the best 5-6 shots and turn them into cards to have on hand at the wedding/reception. It is pretty cool because all you need to do is hand out one, then you have people coming all night asking for cards and passing them around and sharing them. It has worked well with repeat business. The 3 card i like but i think the background color of the first look better. I have to say, and I'm now being very frank and honest, that all the cards shown in this thread yell out "amateurish" and that I've "paid no attention to my visual identity" .. no offense, but they do. I would really urge you guys and girls to hire a graphic designer to get you started with a good visual identity. If you would hand me out a card like that, I'd have to say that honestly it would do more harm than good for your entire appearance and presence (sales speech) you might have given to me prior to that. Logo and trademark can be costly when done good and right, but if you just want a business card without any fancy written out graphic guidelines etc, I'm guessing you'd get it done around 100-200 dollars (judging and guessing that you guys mostly reside in the US). Here's my card for my business (www.milanmedia.fi). My card is not perfect - but I hope you get what I mean, i.a. "less is more" .. of course I have my website & contact information on the back side, but I have not crammed it up with tons of needless and distracting information + plus using dozens of different typefaces with little understanding of visual integrity and type's size contrast. These things matter, really, they do. oops. sorry they're so big.... yikes! I think as photographers we all know just enough graphic design to be dangerous and not quite enough to be really good at it. I agree that most photographer's business cards are too busy --with too many different fonts, too many different colors and too much going on. I also don't think that a photographer always needs an image on the card. I use dog images on my card because I think dog people love to see them. My people card does not have any images on it and I plan to keep it that way. I'm changing them up slightly - so I'll post an example when they're finished. 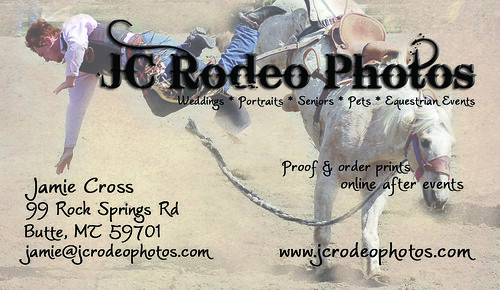 This is the one I use for my rodeo events. I'm currently making up a new one for the portrait side of the business. I love the dog cards Teresa!